This digital optical/coaxial audio extender kit allows users to transmit digital audio sound for long distance up to 500 feet or 150 meters using a low-cost Cat5 or Cat6 twisted pair Ethernet cable. This digital audio extender supports transmitting digital PCM stereo and multi-channel digital audio such as LPCM 5.1, LPCM 7.1, DTS 5.1, Dolby Digital, Dolby Digital Plus. These units can switch between coaxial and optical digital signals and can be powered by either USB wall charger or DC power adapter allowing users flexibility of choice between power sources. Cost-effective solution for extending digital S/PDIF audio signal for longer range with neat setup for all professional installers. The installation is very easy. No configuration needed at all. The local transmitter should be connected to digital audio source such as CD/DVD player, computer, HD cable box, Blue-ray player, etc. The receiver module should be placed at the remote location for connection with A/V receiver, stereo amplifier, speakers and so on. Finally the transmitter and receiver can then be linked using standard Cat5e or Cat6 cable. Only the transmitter or receiver unit needs to be powered for minimizing the load on your HD or computer audio sources. 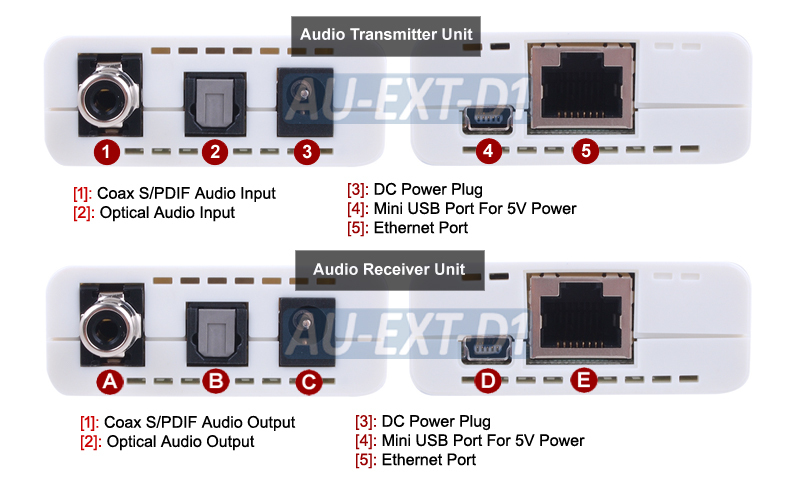 This digital audio extender kit supports 1 optical audio input and 1 coax S/PDIF input. Coaxial input will be sent to the coaxial signal output. Optical audio input will be sent through the optical signal output on the remote end. Both type of digital audio can be transmitted at the same time. CAT-5 and CAT-6 twisted pair cables are widely popular and easier to be hidden away in hallways, buildings and behind walls for ultimate flexibility. Easy to customize the cable length as needed. No need to have digital audio cables prefabricated. This digital audio extender can transmit digital S/PDIF audio signal for over 500ft (150m) cable run while maintaining superior audio integrity with the same clear and sharp sonic quality outputs all the way as the original input. Support all digital PCM and multi-channel S/PDIF surround audio formats such as PCM 2-CH LPCM 5.1 or 7.1, DTS 5.1, Dolby Digital, Dolby Digital Plus. 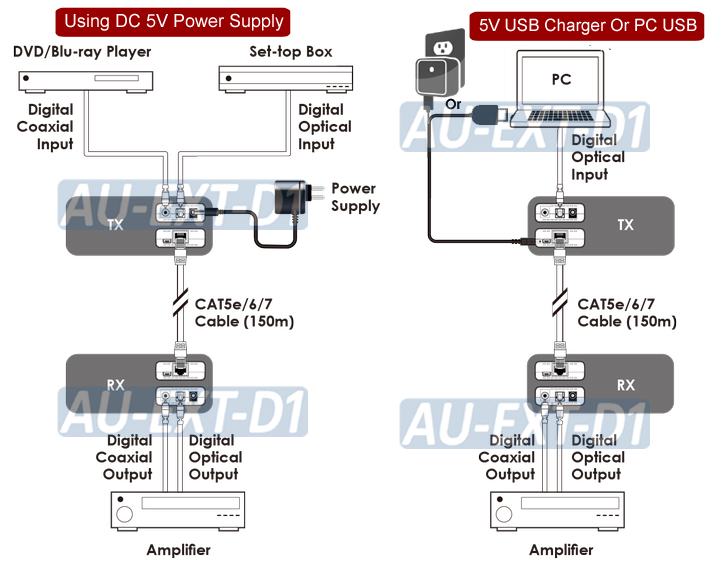 Either transmitter or receiver unit can be powered from using the included DC power adapter or through USB connection with computer or wall charger, providing users flexibility of power choice, reliability and minimizing load on your HD or computer audio sources. Cost-effective solution for extending the digital S/PDIF audio through using single low-cost Cat5e or Cat6 cable for up to 500 feet or 150 meters away from the source. Supports all digital PCM and multi-channel S/PDIF surround audio formats such as PCM 2-CH LPCM 5.1 or 7.1, DTS 5.1, Dolby Digital, Dolby Digital Plus. Send your Dolby 5.1 or DTS surround sound audio over cat5/cat5e/cat6 cable for long range setup. Audio transmitted digitally with no signal loss. Supports single optical input to optical signal output. Supports single coaxial input to coaxial signal output. Dual digital audio inputs: 1 optical input and 1 coaxial input. Supports industry standard Category 5/5e/6 cables. Maintaining superior audio integrity and sharp sonic quality all the way as the original input. Clear digital audio sent over long distance with no loss on the sonic quality. Make out-of-the-way connections for further distribution and integration. Unit can be powered by either USB wall charger or DC power adapter allowing users flexibility of choice between power sources. Digital Audio Format Support: digital PCM stereo and multi-channel LPCM 5.1, LPCM 7.1, DTS 5.1, Dolby Digital, Dolby Digital Plus. Cable Link Connectors: RJ-45 Shielded x 1 on both TX and RX unit.